A celebration of 90 years of the “carrinho de cha” – or tea trolley in Portuguese – took a commanding place in the design section of the sprawling exhibition in Oscar Niemeyer’s Pavilion Bienal in Sao Paulo’s Ibirapuera Park, the green lungs and heart of an outsized city of tower blocks and traffic jams. The Ciccillo Matarazzo Pavilion, to give the Bienal Pavilion its more formal name, since 1957 has been the headquarters of the Bienal de Sao Paulo Foundation, which organises the world’s second oldest art biennale. Venice’s is the oldest. The pavilion also hosts the central exhibition of the annual SP-Arte, already as rich a cornucopia as most ardent art-lovers can digest. Adding to the abundance, this year’s fair included for a second year running a section on the work of prominent architects who also design furniture – in homage to Niemeyer, whose ultimate chair in which to lie back and think creatively was also featured. Among the living architect-furniture designers, Brazilian Bel Lobo gave us Bela, a striking wooden desk. Its classic simplicity connected it with the beginning and end of the tea trolley line-up just across the pavilion, which, from Gregori Warchavchik’s 1928’s cart to Zanine de Zanine’s 1918 version, placed the emphasis on confident, stylish lines. A criticism in the local and art press of the SP-Arte was that it was a bubble, ignoring a turbulent political backdrop in the month the nation’s first working class president was ordered to jail as he fights corruption charges, meaning he is likely to be barred from contesting elections later this year. It is true the joy of an exquisitely designed object can lose its charm when its price tag places it beyond the reach of all but a few. Less escapist – or perhaps still the indulgence of the privileged – was another novelty, this time in the performance space, where living installations brought together artists of varied backgrounds to act for the duration of the fair. The actor huddled next to the heap of dirt – or is it ashes? – and ceramic urns might have been as genuinely exhausted as he looked. On top of escapism, another charge is that an arts fair branded international was overwhelmingly Brazilian, including only a handful of big-name foreign art studios, such as Berlin’s Neugerriemschneider, represented by a shiny steel structure of bikes and a mirror in which we “BEHOLD OUR FUTURE EXECUTIONERS”. Should that be too bleak for your taste, Sao Paulo’s Marko Brajovic studio’s Eden Tree is a possible remedy. 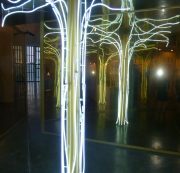 Commissioned by Perrier-Jouet, Eden Tree is a mirrored, golden multi-sensory forest, through which you wander and absorb magical music, as a kind of objective correlative of the emotion of drinking from the Belle Epoque Perrier-Jouet bottle. With a great deal of luck, the world might have more to justify such celebrational moments when SP-Arte’s annual fair returns next April or even in time for the full biennale in September. In the event it doesn’t, art can still console.